Bedroom decorating is important. It all starts with the bed in a bedroom, which is probably an obvious point to make…but it’s the largest item in most cases. 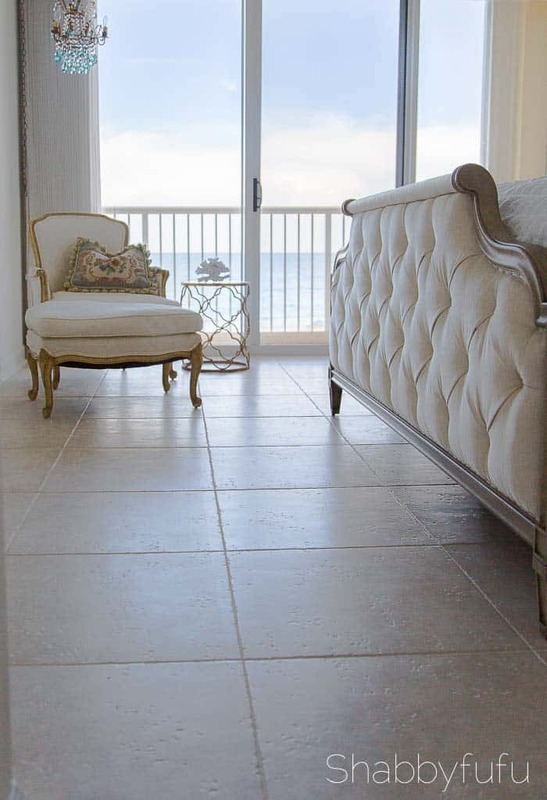 We have been upscaling our beach home as I’ve been chatting about it here for the last few months and the master bedroom came into play after the kitchen. 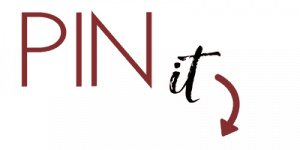 I’ll be sharing the full reveal on the kitchen soon and can’t wait to share my thoughts! With this view I have always felt that I could do better and give the room the look I felt it deserved. 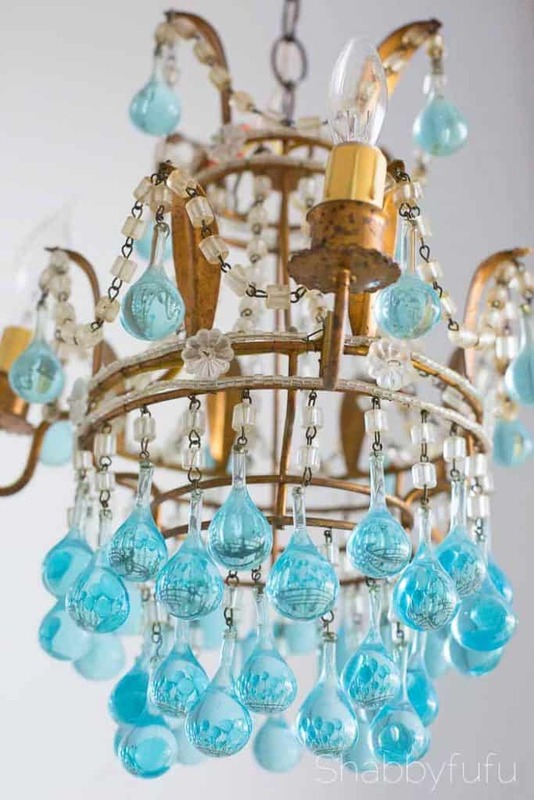 Quiet and calm with a hefty dose of inspiration from my love of French antiques and coastal charm. Nothing too over the top fussy though and easy to keep clean, as I have allergies and we have dogs. Combine that with the fact that we don’t live here all of the time (yet;-) so clutter is not a great thing because that means dust bunnies. It started with the bed and no matter the budget you can find a bed to suit your own personal style, or perhaps recycle something passed down with paint. 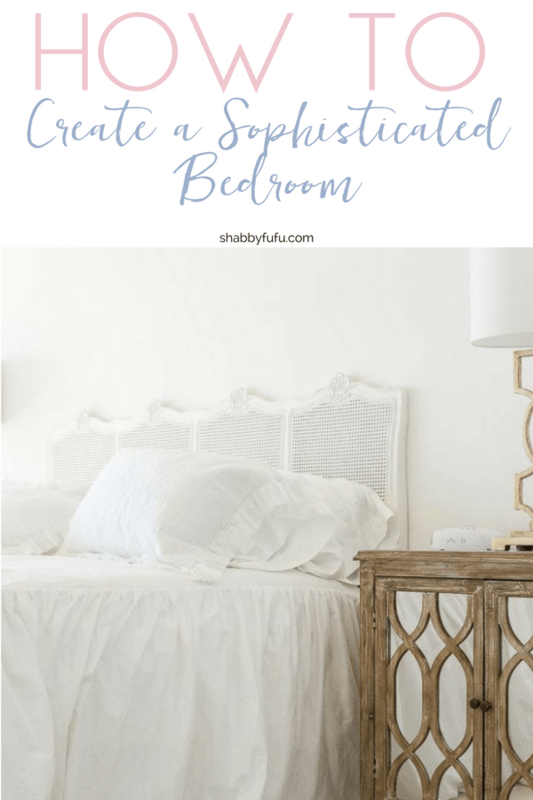 I’ve been doing that in this room for many years with the French cane headboard and other vintage pieces and it was fine…but waiting for something else. I’m so grateful and thankful to my wonderful friends over at Bernhardt who I’m partnering with in making this sophisticated new look come to life! Just a quick note that Bernhardt is based in the U.S. and has been in business since 1889 and the quality is perfection. You can see all of their collections here and find out where to purchase pieces if interested. Grounding the room with a statement bed adds so much, even if you do nothing else. I look at a great statement bed in the same way that I do a sofa. It’s important to have quality pieces that will last in the large objects of a room, that give years of comfort and then you can just accessorize with everything else. 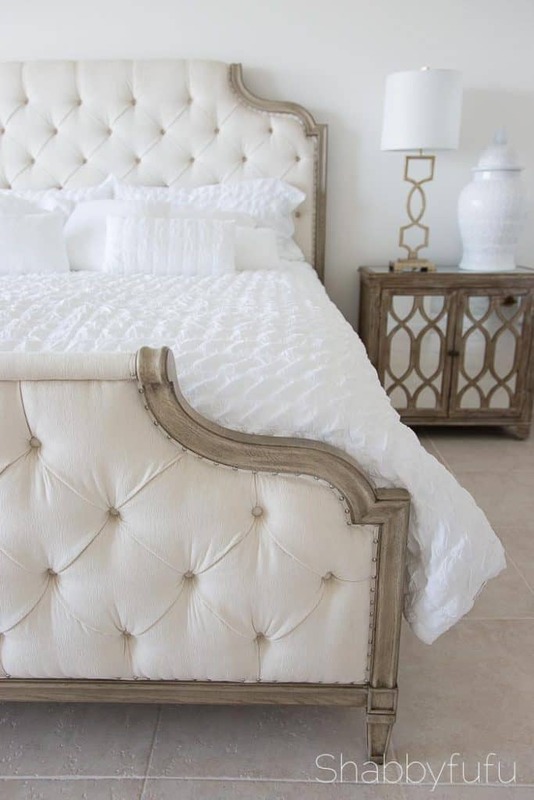 I chose a bed that had a frame and a footboard from the Marquesa Collection which I had fallen deeply for at High Point Market. With it’s raised Cashmere Gray frame, silky cream fabric, button tufting, and nailhead trim…these all add to the sophisticated charm I was after. There are lots of options in all price points these days for button tufting and it really adds to the refinement factor. 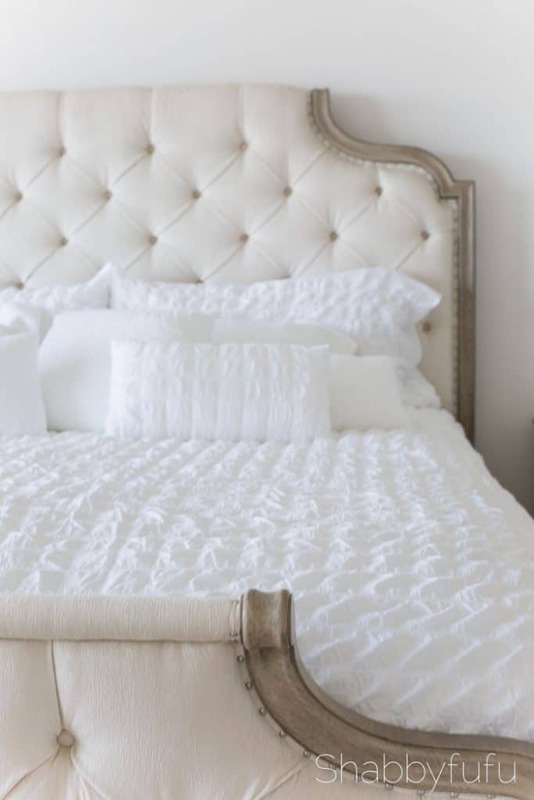 Fresh and crisp white linens are always a favorite of mine and white reflects light for that cool feeling that you want in a bed. A dash and splash of femininity with some understated ruffles is something that I prefer. 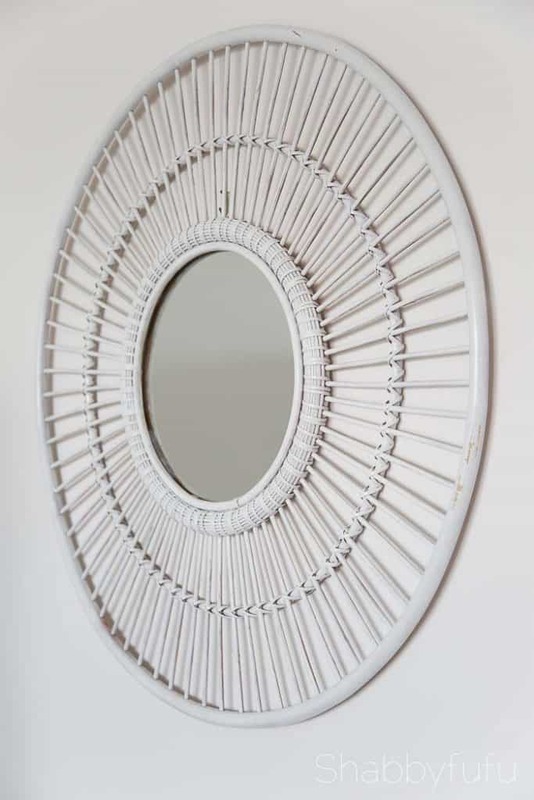 This mirror was an inexpensive find and I spray painted it white and hung it on the wall opposite the beach view to reflect. Without the paint, it felt too boho, but the simple white paint kicks it up in style. 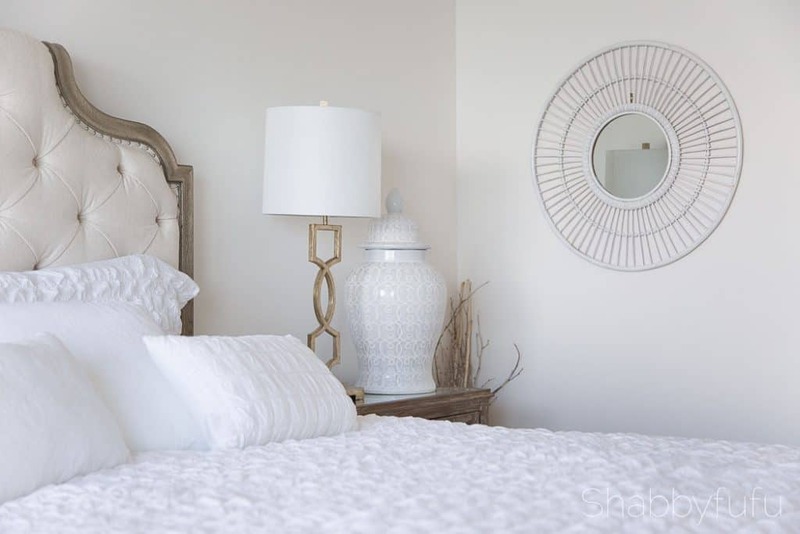 Bedroom Decorating Idea – Find Great Nightstands! The nightstands have the beachy driftwood look that I wanted for this room and you can see the early stages of the room transformation here. Mirrored furniture ups the look with glamour and can be taken as far as an entire suite, but here…it’s more casual. The lines of the cabinet wood are “mirrored” by the gold lamps that are clean and modern, but still, have a casual feel when all is put to the test. With fewer pieces for a clean look, everything serves a multipurpose in this room. 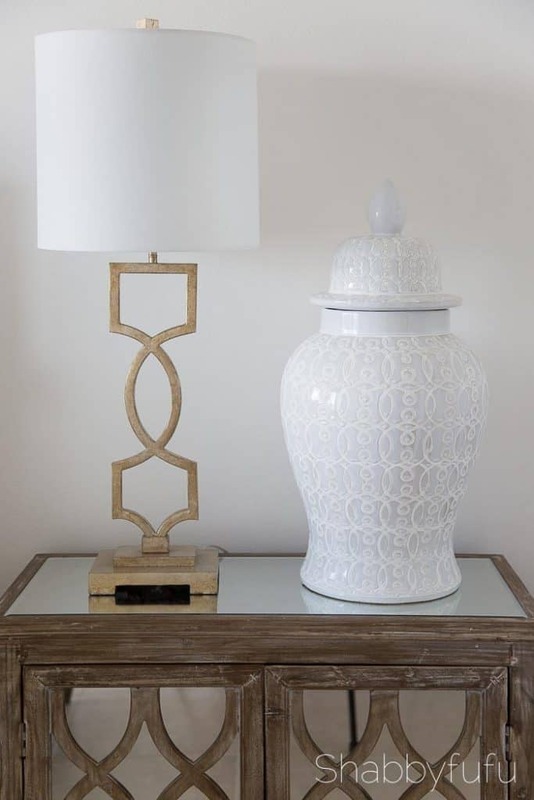 The nightstands have shelves for storage and the oversized ginger jar is large enough to stash with bits and bobs or take the lid off for floral display. 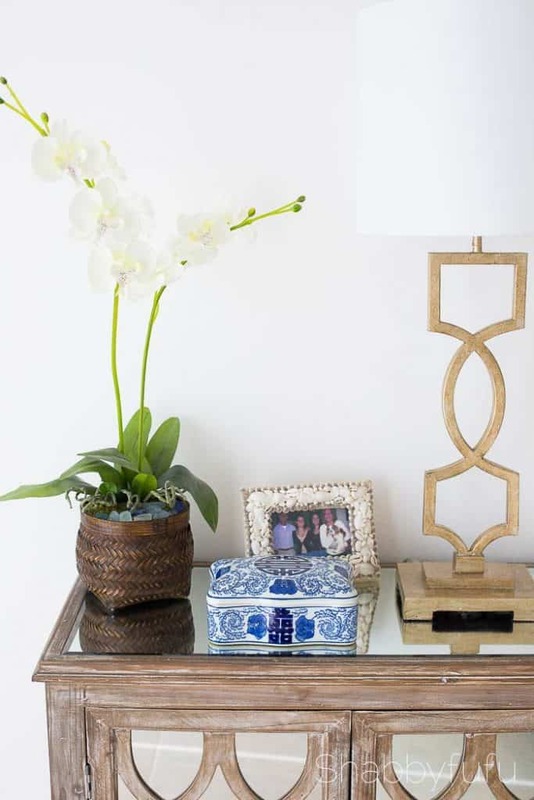 An orchid, a Chinoiserie lidded box and a family portrait on my side of the bed for layering a stylish theme. 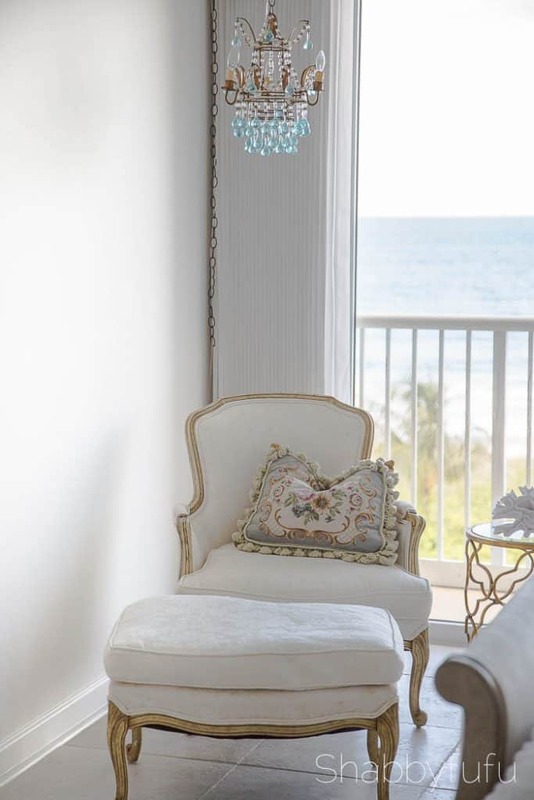 I’ve had this French chair and ottoman for probably twenty years now and in selecting timeless pieces they will never go out of style. Found at a local yard sale, I had it recovered in a cream damask that stands the test of time. Timeless = sophistication and doesn’t have to be expensive if you do a room slowly over time. 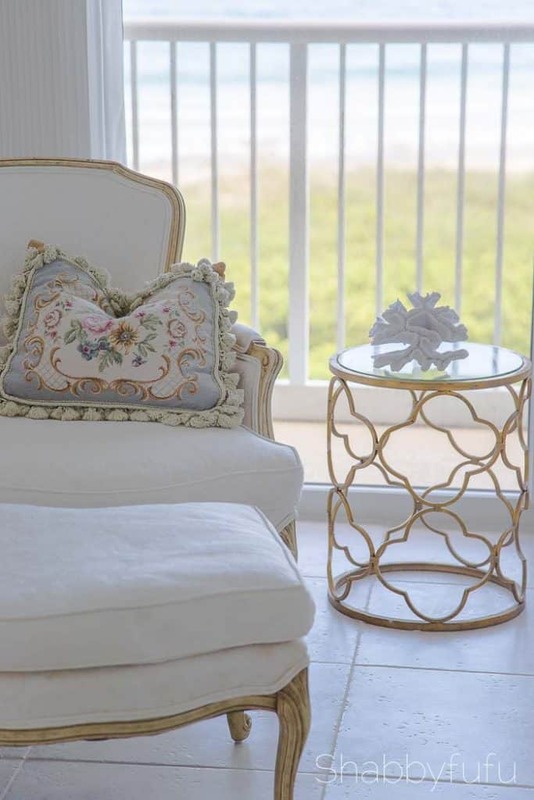 An inexpensive gold quatrefoil table next to the chair where I often sit and read a book or work on my laptop. What is it about shapes and lines like this that just look so sleek?! 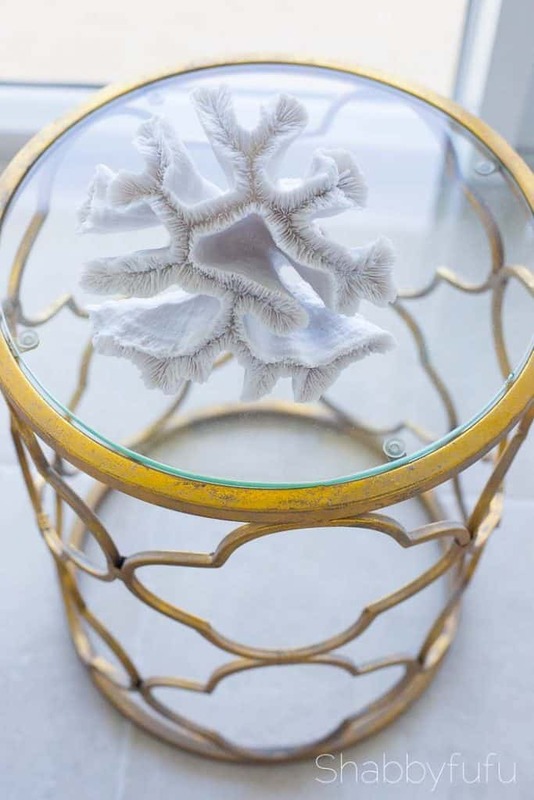 It’s the beach…so coral and shells in small doses are a must. SMALL doses are key to my eye and underwhelm, but look great in the finished design. Ground your room with a beautiful bed that makes a statement, whether old or new. 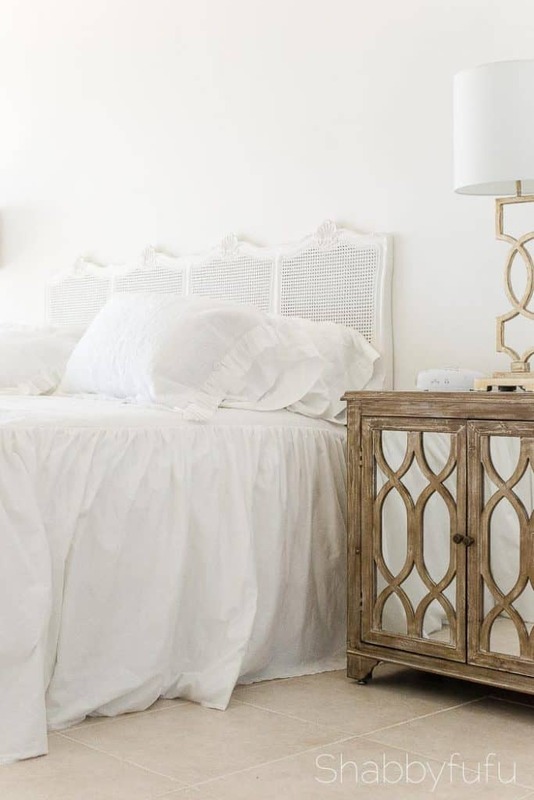 Select linens that you can accessorize easily within neutral tones, such as white or cream. Go for the best quality and thread count that you can afford. Keep accessories sparse and use oversized items instead of lots of small clutter. Add storage if you need it, but keep it behind closed doors. There are lots of options for mirrored storage these days that will add glamour and light while keeping the room clean. Don’t forget a soft place to sit and go for something elegant. Thank you to Bernhardt for sponsoring this post (and allowing me to feel like a queen;-)…all thoughts and photos are my own.